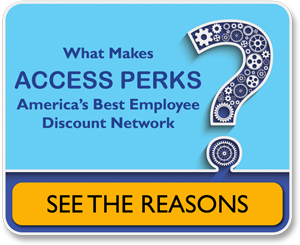 Make your workplace a better place with America's largest employee discount network: Access Perks. Access Perks gives your employees access to corporate discounts on purchases they make every day -- near the office, near home, for business travel AND on vacation. Unparalleled selection. 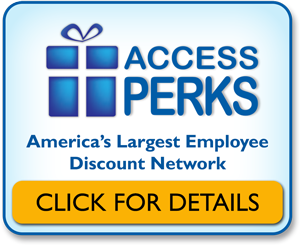 With over 300,000 employee discounts to choose from, Access Perks gives your employees more ways to save than any other employee discount network in America -- on dining, shopping, travel, family fun, auto care and more. Your employees can easily stretch their paychecks by hundreds, even thousands of dollars on purchases they make EVERY DAY. EXCLUSIVE offers. Has anyone ever told you "you're special," only to discover they say same thing to everyone they meet? That's what it's like offering discount "benefits" that are actually available on public deal sites. Instead, we contract directly with the merchants in our network to secure private, best-in-class offers that are truly a benefit to your workforce. America's largest "show your phone" mobile coupon network. In today's fully mobilized workplace, employees want to be able to save money while on-the-go. That's why Access Perks comes with a mobile coupon app that allows employees to simply show their smart phone right at the point of purchase. Fast, easy setup. Getting started with Access Perks is easy, with no involvement needed from your IT department. You simply provide us with your company's logo, and we take care of the rest. These are just some of the reasons we think you'll love offering Access Perks employee discounts to your staff. To learn more about Access Perks for your office, contact us today for a free, no-obligation demo.